www.dolphinhouse.chobs.in has not been in service and do not book from that site. A world of sensual pleasures, waiting for you on the shores of beautiful Nagaon beach. Nagaon is called " Little Goa of Maharashtra" and has inspired many Bollywood directors to shoot movies on this beach. It is near Mumbai (only 110 kms from Mumbai Central) and 8kms from Alibaug bus stand. Nagaon beach is the best beach and the sand is nice and soft. It is the perfect place for joggers and walkers. You can just spend whole day on the beach relaxing and swimming in the sea. Nagaon beach has become most popular for water sports and Para sailing with modern boats. There are other beaches in Alibaug too, but 90% of the tourists wishing to stay in Alibaug resorts, prefer to stay near Nagaon beach. Nagaon beach is rated as No.1 beach in Alibaug. Ideally located just 2 minutes from beach, Dolphin House Beach Resort provides neat and clean accommodation having air conditioned rooms, cottage with indoor swimming pool and delicious home made food. 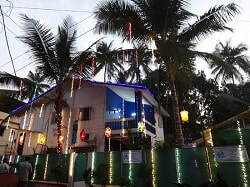 If you are looking for Alibaug hotels or Alibaug resorts the Dolphin House is the best choice. Stay on week days and avail 25% discount on tariff. 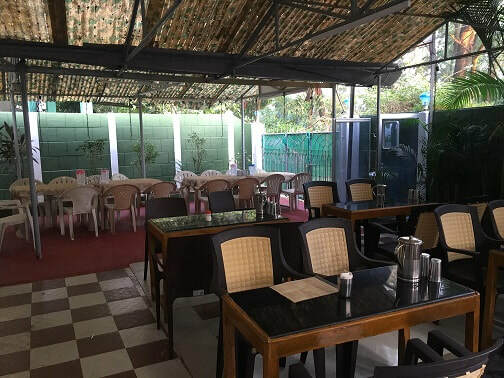 Tip: If you want to stay in resorts near Nagaon beach, Alibaug then first find out the distance of hotel from Nagaon beach and also whether the hotel has swimming pool. Dolphin House has two bungalows (Cottages). Main cottage bungalow has five rooms with attached bathrooms and one dormitory with two attached bath rooms also one double room cottage having two double beds and two single beds. Second cottage bungalow has 3 double beds with attached bathroom. In house restaurant serving home made food. Indoor Swimming pool with waterfall. ON-SITE DINING OFFERS ENTICING OPTIONSFind culinary masterpieces at our on-site restaurant. Our Indian cuisine invites you to indulge your taste buds with fresh pomfret and Surmai either fried or with masala dry . Try our Prawns fry, prawns masala or prawns coconut curry or order one of the chef’s specialty chicken masalas for a taste of India. Next up, Our Vegetarian cuisine features typical Maharashtrian Thali or try our special Paneer tikka makhani or Dum aloo Kashmiri , making it ideal for memorable dinners. You can also try other dishes from a tempting à la carte menu. ​Finally for desserts, coffees, teas and smaller dishes, Dolphin Restaurant is the perfect place for a quick bite. Nearest Airport: Mumbai (107 kms)and Pune(153 kms) : Taxis Available at both the airports and will take about 3 hrs to reach the resort. Nearest Railway Station: Pen (35 km). Taxis and auto rickshaws available and will take about 1 hr to reach the resort. Nearest Bus Stand: Nagaon (1km), Alibaug (8km): Auto rickshaws available. By Ferry from Mumbai: Catamarans are available from Gateway of India, Mumbai to Mandwa jetty ( 26 km from the resort). Catamaran operators provide free bus transport up to Alibaug bus stand. Check Ferry Timings.